Seeing the sun through the tunnel of darkness on my walk sends calm and hope to my being. We have our share of gray days here in Northeaster Pa, so when the sun comes out it, everyone want to shout out "Hallelujah!." Hence, the title of this piece - 40" x 40" on charmeuse silk. There's something about ferns that intrigue me. They seem to be the sort of 'oak tree of plants' with their sturdiness, beauty and quiet strength. These two 30" x 40" acrylic and collage on wood titles 'Verdant 1 and 2' can be seen at Marquis Gallery in Scranton, Pa.
New look for the SPCA - A bit of color goes a long way! I have openings the first and second Friday in September . I hope you will come because YOU are invited! First Friday in Scranton, PA at Artworks Gallery with Sharon Cosgrove. Second Friday - Kingston, PA at Wyoming Seminary's new Rusty Flack Art Gallery. The Rusty Flack Art Gallery at Wyoming Seminary is pleased to announce that area artist and muralist Leigh Pawling will be featured in the Gallery’s inaugural professional exhibit, running September 1-30. The solo exhibit, titled “Layers of Light: An Exhibit by Leigh Pawling,” will be on display in the Gallery, located in Sem’s Kirby Center for Creative Arts, 260 North Sprague Avenue, Kingston. The public is invited to meet the artist and view her exhibit during a reception on Friday, Sept. 9 from 6:00-8:00 p.m. The exhibit also will be open to the public on September 3, 10, 17 and 24 from 1:00-3:00 p.m. or by appointment. Pawling, of Dallas, has been a painter, muralist and teacher for nearly 25 years and her exuberant, large-scale murals in Wilkes-Barre, Kingston, Tunkhannock, Pittston and other areas are well-known. 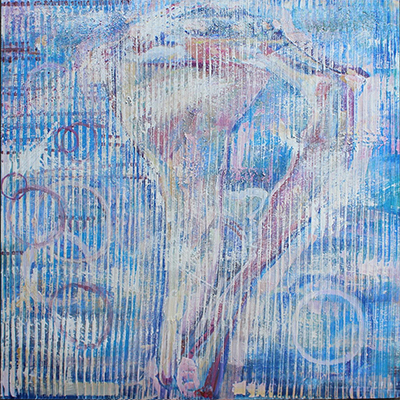 She also has exhibited widely in area galleries in both solo and group shows. A Pennsylvania Rostered Artist, she is a painting instructor for the award-winning prestigious Arts Alive program at Marywood University, held every year in July. This exhibit will feature 15-20 vibrantly-colored acrylic and mixed media works of various sizes, created since 2008. One highlight of the show will be Pawling’s Life Series, a collection of four large works that shows the evolution of a human being from a single entity in childhood, to “couple hood” and parenthood, and finally at the end of life, alone once again. Other works will depict the human figure, common everyday objects and area landscapes. The opportunity to feature work of this high caliber as the Flack Gallery’s first professional exhibit is very exciting, says Dan Krueger, Flack Gallery director and director of Sem’s Visual Arts program. Spending time in the woods renews and grounds me. Here is a commission I recently did of three things I love trees, birds and stone walls. Scranton had so much great energy Friday night. Art with musicians at all the galleries and the Italian Festival.... people connecting through the arts. It's magical. Geisinger Does Paint and Sip ! The last two Fridays I have done a 'Paint and Sip' for Geisinger's fifty-five and olders. It's open to the public, and very well received. These ladies didn't 'sip' much as they were painting away replicating Gustav Klimpt's Apple Tree and the following week Van Gogh's Cypress Tree with Wheat Field. It takes a lot of couraget to do something new. Hats off the the participants!! Some recent works inspired by nature. 'Whoosh' Mixed Medium tripych each "36 x 18"
"LL Birch" mixed medium 36" x 18"
"Columbine 2016" mixed medium 40" x 30"
Forty Seven. You Are Loved. Rest in Peace L.M. In 2005 I was asked by Sharon Cosgrove artist and professor at Wilkes University to participate in an extraordinary 'paint along' with Turkish artists who were coming to Wilkes-Barre to paint for the week. We were sponsored by Linde Corporation who is business partners with Mete Bora who sponsors artist 'residencies' throughout the world. He is a huge patron of the arts hence creating SummArt - a huge platform in Istanbul for performing and visual art. Three years ago Scott flew Sharon and me to Moldova where we were hosted by Mete. We painted along Turkish and Romanian artists for a week and treated like royalty. Recently Scott asked Mete for a smattering of Turkish art to display at his office in Pittston, Pa. The work is hanging there as well as some works from the artists who participated in the 2005 paint-extravaganza. As a tribute to Mete whose birthday is June 5 there will be an open house and viewing of the artwork from 2-pm. There are reoccurring themes in my works - and the circle - oh my ! The almighty circle .... always charges me with tingling happiness. So - I paint them - and as of late, I'm really attracted to orange. I have been working away on this mural for the Wilkes Barre Area Practical Nursing school. The director of the school, Mary Beth Pacuska, saw me working on the mural I did last summer for Steve Tarens building Wet Paint in Wilkes Barre. The school being newly spiffed up, had a long hallway which Mary Beth felt needed something.... a mural, perhaps? We worked together coming up with the idea to depict the history of nursing visually. I worked on it on cloth in my studio and we adhered it to the wall on Thursday. The students came out of class astonished! I really enjoyed learning about nursing - some stong woman - Florence Nightengale and Clara Barton.... and meeting Mary Beth, the staff and great students. A couple of years ago I did five very large Eiffel Towers for a new French restaurant called the Manhattan Bistro that is in Wilkes-Barre. A student of mine saw them and asked me to do one for her mom affectionately called LaLa. She gave me a list of LaLa 'isms' - like "We are sisters by birth and friends thanks to Prozac'. Lanie asked me to make it colorful, like her mom who being from Alabama is I'm sure just like her Mom... a beautiful, warm, colorful bundle of good energy and love.